It's almost Summer! That means a lot more people are going to be spending more time outside in the hot sun as they soak up some Vitamin D and Vitamin G(reen) from all of the beautiful lush greenery. With that though, comes a lot more thirsty people and you and I both know, that given the option, a good handful of those people would rather opt for their local bar for patio drinks than to rehydrate with water! It's said that even when we're 1% dehydrated, our metabolism slows, which is responsible for converting food into energy and burning energy! As you can see, water is super important! It's probably the one health topic I introduce in almost all of my talks, workshops and programs. In fact, 5 Ways I Detox Every Daybefore my feet even touch the floor in the morning, the first thing I do is drink a huge glass of water to flush all of the metabolic waste that's produced during the night. Staying hydrated is probably one of the most effective health tips I can recommend if you're looking to make a simple change. A good "bang for your buck" as they say! Then of course, there's the negative health effects of alcohol to consider. Did you know that alcohol burns up your B vitamins which are responsible for converting food into fuel and maintaining energy levels? Some people that have caught onto this make a point of taking a B-complex before bed when they've been drinking! Clever, but not an excuse to overdo it on the alcohol front. Now I don't expect you to sip only on water all summer long. Living a healthy joyous life shouldn't feel restrictive and boring. That's why the Joyous Team and I have come together to bring you 6 healthy, easy and delicious non-alcoholic mocktails! We had so much fun creating and taste-testing these. If only they served these at the local patio bar! These mocktails aren't just for summer either. Really, anyone can enjoy them, but especially those who don't want to drink alcohol for health reasons or pregnant and nursing mama's (you're looking at one – a nursing mama, that is!) I lived off of drinks like this when I was pregnant with V though, especially my Chia Seed Blueberry Drink and Infused Water which naturally ended up in my book, Joyous Detox! I think you guys are going to love these! Peppermint Tea: The benefits of peppermint are most well known for providing natural relief to digestive-related issues including gas, bloating and indigestion. Rejuvenate Tea: This organic loose-leaf tea is a blend of green rooibois, lemongrass, ginger, milk thistle, lemon verbena, hibiscus, lemon peel and lemongrass oil. It's refreshing and rejuvenating herbal blend will help to reduce inflammation in the body and gently promote detoxification to help you feel joyous! You can find it in the joyous shop over here. Lemon Ginger Tea: If you're ever feeling under the weather, this is remedy of choice you want to turn to (hot in the winter, or chilled in the summer). However, sick or not, this is still such a refreshing light drink to sip on in the summer! The lemon will help to boost your immunity due to it's high vitamin C and antioxidant content, while the ginger will help to bring relief to indigestion, nausea or headaches. Raw honey has a lot of antibacterial properties as well, making it a perfect fit for an immune-boosting drink like this. It provides a natural hint of sweetness with a ton of phytonutrient power too. 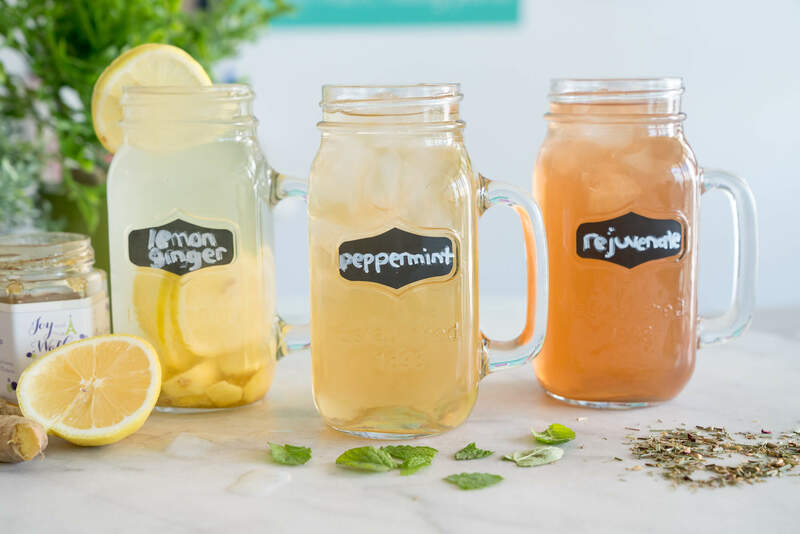 The Inspiration: We love sipping on tea at Joyous HQ, but what a lot of people don't realize is that simply chilling them by putting them on ice makes a perfect summer-inspired drink! I am sipping on the Joyous Rejuvenate tea as we speak and it always blows my mind how simple, delicious and refreshing this is! These 3 iced tea recipes are perfect to serve at a Summer BBQ to stay hydrated while enjoying the sun and are also very wallet-friendly to throw together! Muddle blueberries, rosemary and honey in cocktail shaker or separate cup. Add sparkling water and gently stir with muddled mixture. 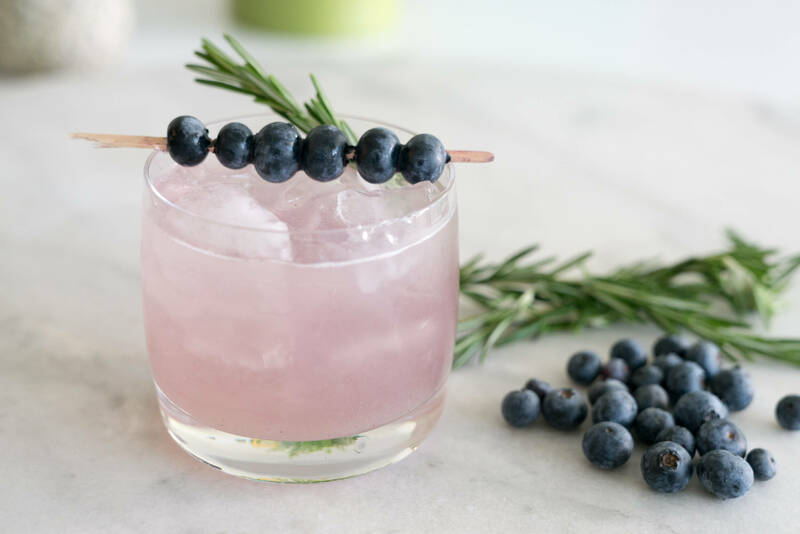 Pour through fine mesh strainer into rock glass, garnish with rosemary and blueberries and enjoy! Rosemary is most recognized for its memory-boosting benefits but has an equally good reputation for improving mood, reducing inflammation and detoxifying the body of pathogens, salt, toxins and excess fat. Blueberries are believed to have the highest antioxidant potency of all fruits and vegetables. Antioxidants help to neutralize free radicals that can cause damage to DNA and potentially lead to cancer and aging. 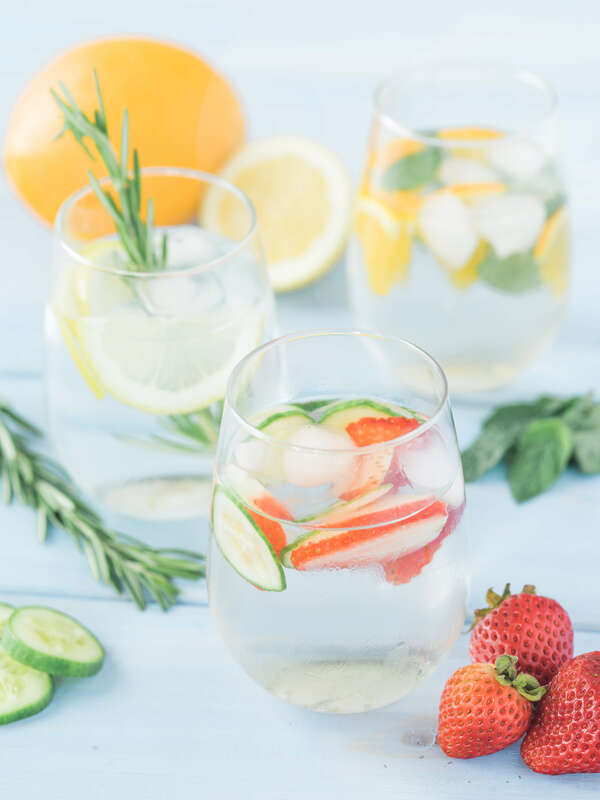 Recipe: Find the Strawberry Cucumber Basil, Rosemary Lemon and Orange Mint Water recipes on pg. 155 in Joyous Detox! Adding fruits and veggies to your water is a great way to increase the hydration content of your already hydrating water. You will also benefit from each of the healing and nutritional properties that each of the fruits and vegetables provides. For example, lemon and water together come with a wealth of nutritional benefits which you can read up on here. The Inspiration: Since some people don't drink enough water or simply don't enjoy the taste of water, adding fruits, vegetables or herbs serves as a great and inexpensive way to get people drinking more water which will ultimately help them feel more energized and get them detoxing more effectively. Kombucha is a fermented food, meaning it is loaded with tons of probiotic-rich bacteria that will help proliferate "the good guys" in your gut. Having a good balance of "good guys" and "bad guys" in your gut (but more good than bad, preferably) is beneficial to help assimilate nutrients, break down foods and maintain strong immunity. Mint, like peppermint, has a lot of health benefits when it comes to digestion. The aroma of the herb alone activates the salivary glands in the mouth which secretes digestive enzymes which are necessary for digestion. 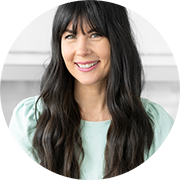 The Inspiration: Rachel created this drink as she is a huge lover of kombucha (and conveniently had a fresh homemade batch at home) and loves integrating healthy habits into "everyday indulgences". 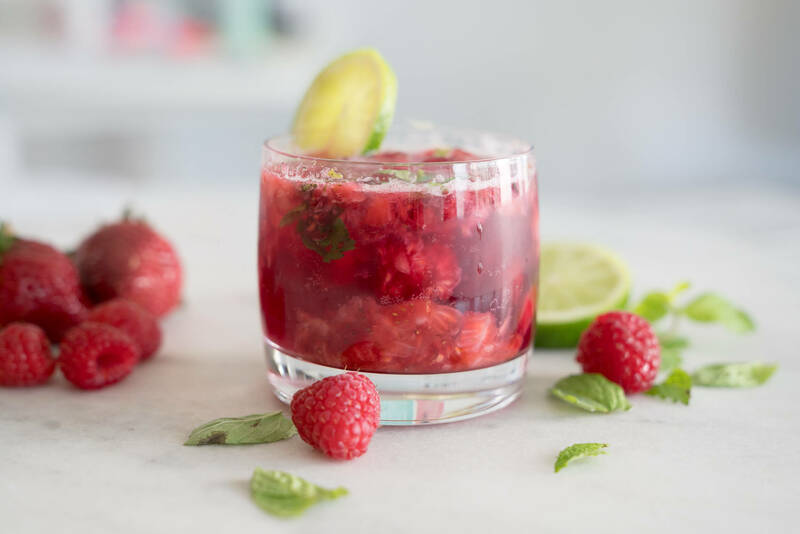 This is a super easy mocktail to throw together but offers a lot of "WOW" factor – especially when you explain to your guests how you "muddled" the berries and mint to make this beautiful creation! 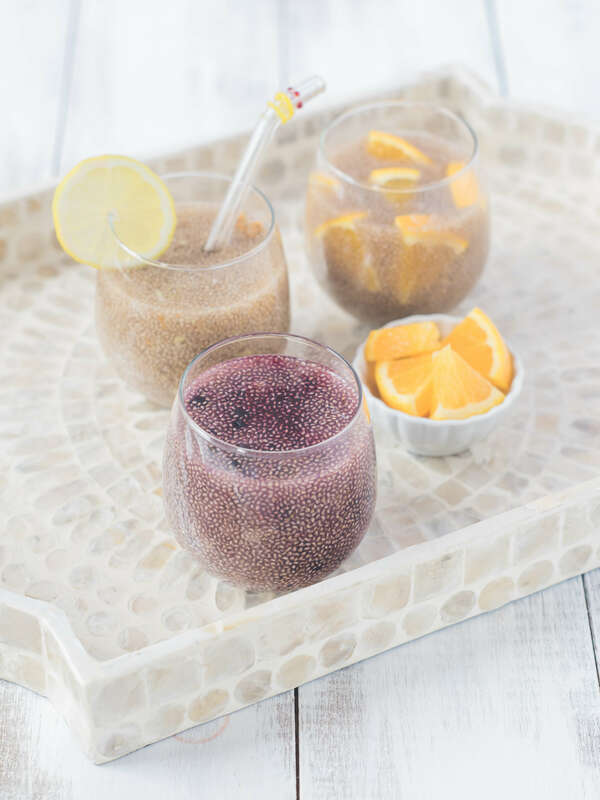 Recipe: Find the Chia Seed Blueberry Drink, Chia Seed Orange Kombucha and Chia Seed Ginger Lemon Drink recipes on pg. 133-134 in Joyous Detox! Adding chia seeds to your water is a great way to get more fibre, protein and healthy fats into your diet which will help you eliminate and detox more effectively. It serves as a great snack to enjoy between meals as the high protein, fibre and fat content will keep you satiated and give you a "full" feeling. Chia seeds are also known to absorb 10X their weight in water which means they are going to keep you hydrated that much more longer. The Inspiration: We love chia seeds, whether we're sprinkling them in a smoothie, Chocolate Chia Mousse(pg. 252 in Joyous Detox) or in these hydrating fruity chia beverages! What are some of your favourite healthy drinks to sip on? These look wonderful! I don't have a juicer but I do have a Vitamix. 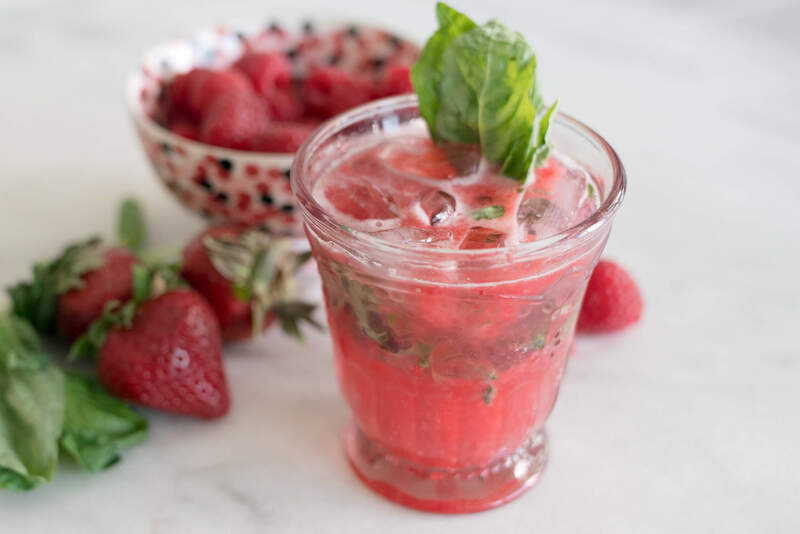 Any recommendations on making the strawberry raspberry basil spritzer? Thanks! Delicious list! Just wondering if it's safe to consume kombucha when pregnant?